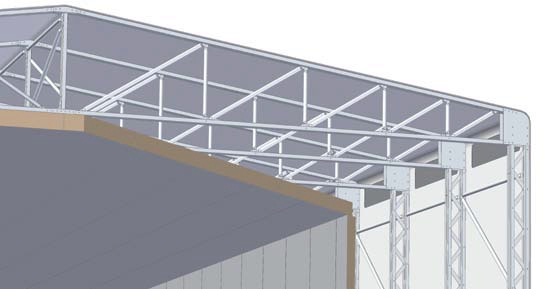 The metal structure is made of box and tubular galvanized steel with sendzimir method, boasting a high degree of standardization using CNC machines that operate in autonomous processing, from the collection of the bars to the palletising of finished product. The structures are manufactured with completely robotized latest machinery; this type of equipment ensures maximum accuracy (1/10 of mm) at every stage of processing. The joints are realized by means of plates, installed and fixed using bolts M12 8.8; the number, size and the thicknesses of these plates are calculated depending on the site location and the dimensions of the structure. All possible angles that could create friction with the mantle roof covering are rounded. The trusses are joined together, according to the case, by pantograph bars or fixed by spacers adapted to create a series of double arches, these elements are completely bolted together, making it easy to intervene in case of damage, disassembly and replacement. The trusses slide on special fully tropicalised steel wheels, diameter 120 mm, double ball bearing sealed, waterproof, dustproof and completely maintenance free. The runways are made of steel bent to shape, thickness and size depending on the dimensions of the structure and on the site geographical location. The runways provide a seat in which there is a special anti-derailment device fixed to the hub of the sliding wheels, they can be fixed to the ground by means of dowels steel screw 10x90 or embedded, flush with the floor, in a concrete casting. The tension of the structure is made by means of traction ratchet belts, CE marked with loads certificates, the belts have completely replaced the old chains, less expensive and commonly used, but not certified. The roof covering is made of sturdy PVC mantle, smeared with a fire-resistant class M2, the weight by 900 grams per square meter which are manufactured in Europe. The mantle has special plates welded hosting half-metal rings that allow attachment to the solid metal structure by means of special high-strength straps; this type of fixing is, among all those present on the market, the more expensive but surely the one that offers the best guarantees of seal and dimensional stability of the fabric. All the mantle covering areas at risk of tearing, that could be caused by friction with the metal parts due to the continuous action of atmospheric phenomena , are reinforced with a double layer of cloth. The roofing ensures maximum water resistance to the weather, provided by a single artifact made of multiple parts welded together and that incorporates roof cover and sidewalls; any welding work made of the same material, will not affect the normal weather and water resistance and will not be considered "repair", but simply production finishing. The heads are equipped with the front triangle made of PVC membranes, anchored at the metal structure using special aluminum profiles. The front and/or rear heads can be closed with sliding curtains to be opened in two parts complete of stakes, fix-down bolts, tensioning straps, handles and latches. Any condensation problems cannot be considered manufacturing defect, because they cannot be foreseen and are not related to the qualities of PVC. The occurrence of these phenomena is not frequent and it can only happen in some periods of the year, it can be 100% solved installing an additional mantle positioned under chain and it can be placed also after installation of the roof covering. The correct placement of the structures requires that they should be placed on a solid footing made of reinforced concrete, a compulsory condition in order to ensure their right strength to snow, wind and earth-quake. Such works may be constituted by: a pair of curbs (standard); a curb plus a row of plinths (side); by two rows of parallel plinths (shed) or by an existing or new floor platform. Foundations must be dimensioned to ensure adequate support to the structures they are going to support, for this reason they are designed and made in collaboration with our technical office. Shape and size of foundations will vary not only according to the structure they will support, but also depending on the area seismic classification according to the country or region rules. These works must be carried out paying particular attention to the coplanarity of the support points. Mantle certified Class II fireproof self-extinguishing – color of your choice. Left side: Closed with fixed pvc mantle. Right side: Closed with fixed pvc mantle.